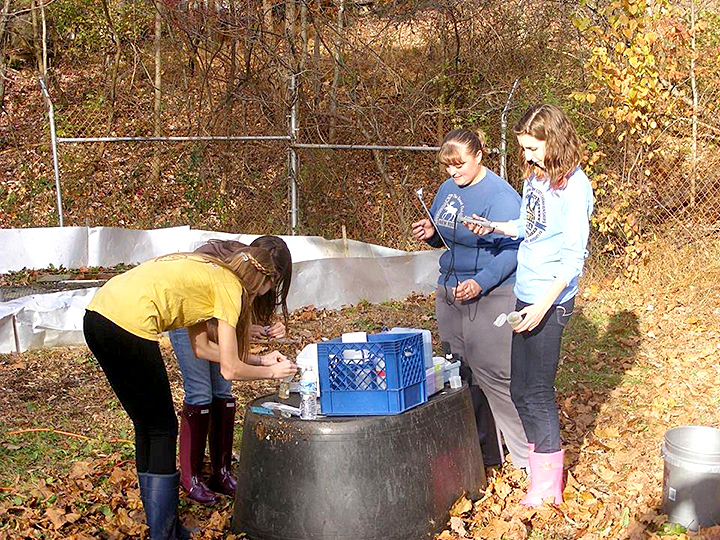 Since the fall of 2009, Little Sewickley Creek Watershed Association has sponsored an after-school environmental science internship for Quaker Valley High School students. 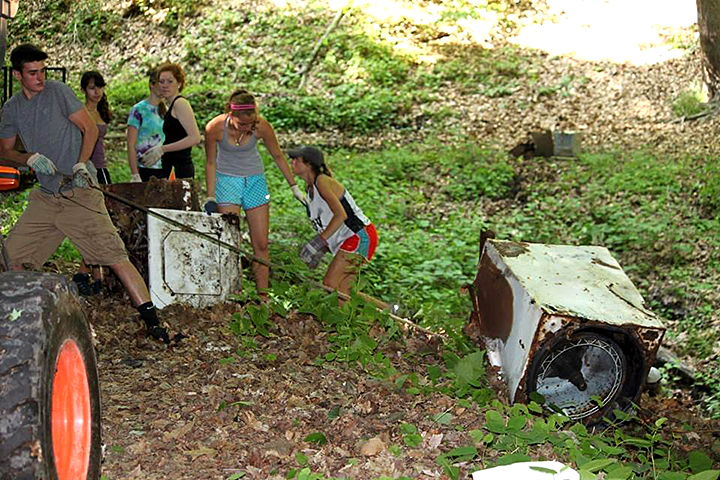 Interns work in collaboration with environmental educators from Fern Hollow Nature Center and Creek Connections of Allegheny College to monitor both biologically and chemically Little Sewickley Creek and its tributaries. Application for the 2019 Summer Internship can be downloaded here. 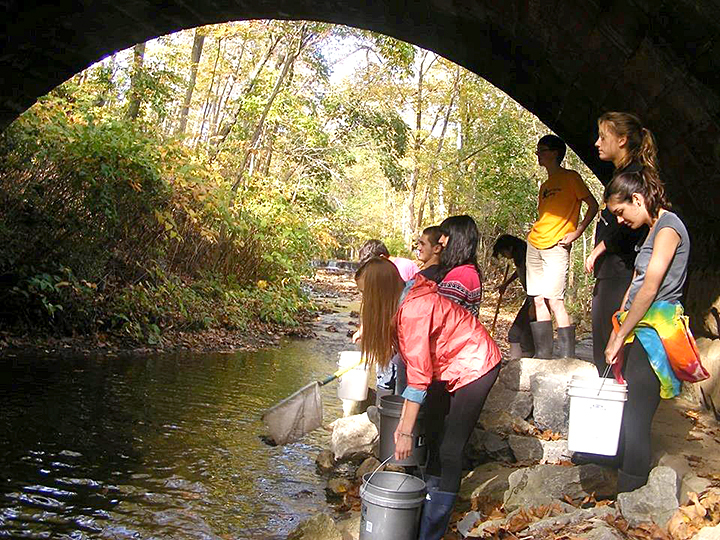 Fall 2013 - QV Creekers wait under the Woodland Road Bridge to begin netting and counting fish for their Fish Diversity study of Little Sewickley Creek. Fall 2010 - QV Creekers net fish in a pool under the Woodland Road Bridge during the annual fish-shocking activity, part of their ongoing fish diversity study. 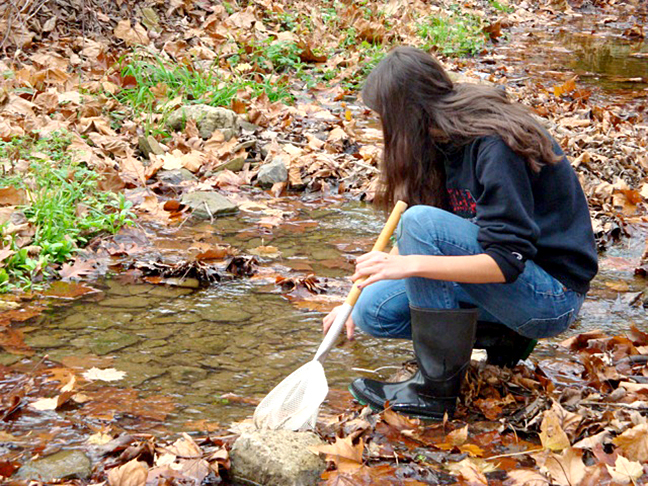 QV Creekers Genevieve Abell, Katy Garvey, Ellie Johnston and Lauren Downing (2009) conduct water quality analysis using HACH kits on samples collected from two tributaries in Wagner’s Hollow located in the northern branch of Little Sewickley Creek. 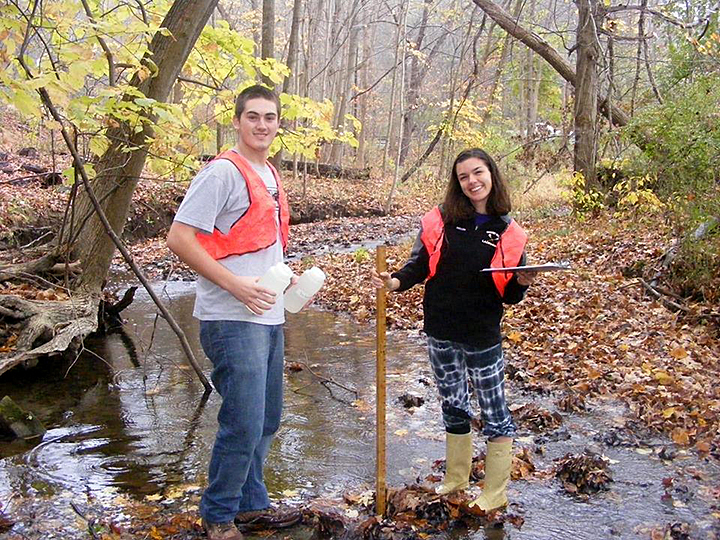 QV Creekers Derek Hiller and Madeline Hoey take measurements for ALLARM sampling in the northern branch of the watershed near Barberry Road in the fall of 2013. Monthly baseline water quality information is gathered through ALLARM testing which includes recording the TDS, conductivity, temperature, water level and surrogate flow (ft2) at each sample site in the watershed. QV Creekers Annie Halcomb and Emily Veeck sort through macroinvertebrate leaf packs that were placed in the creek several weeks before the Fall 2013 creeker training event. 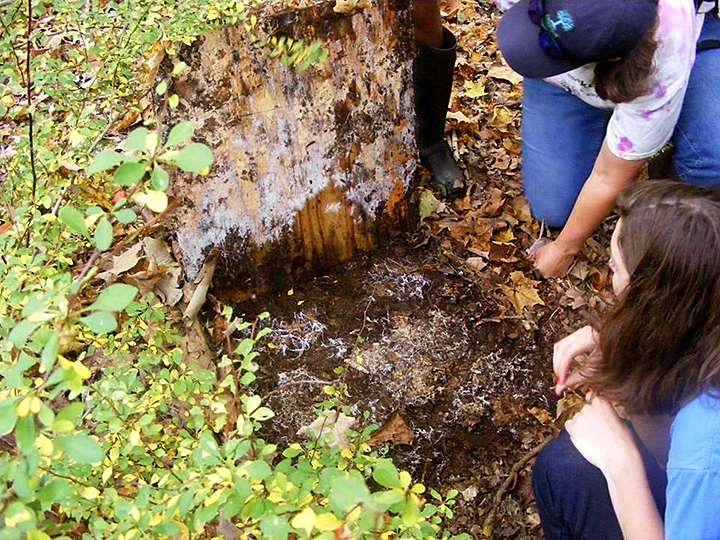 This allowed creekers to see the various types of benthic macroinvertebrates that inhabit the creek. Several different leaf types were used. 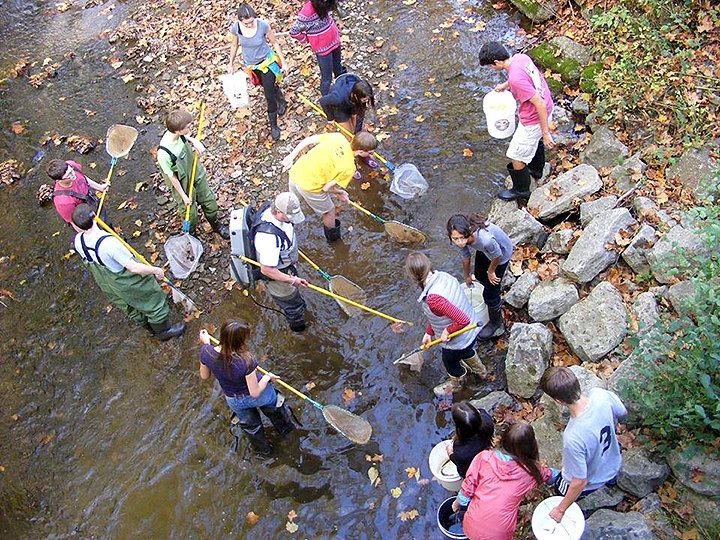 Fall 2013 - QV Creekers study fish populations and diversity in Little Sewickley Creek during a fish shocking activity with Eric Chapman, Director of Aquatic Science with the Western PA Conservancy. 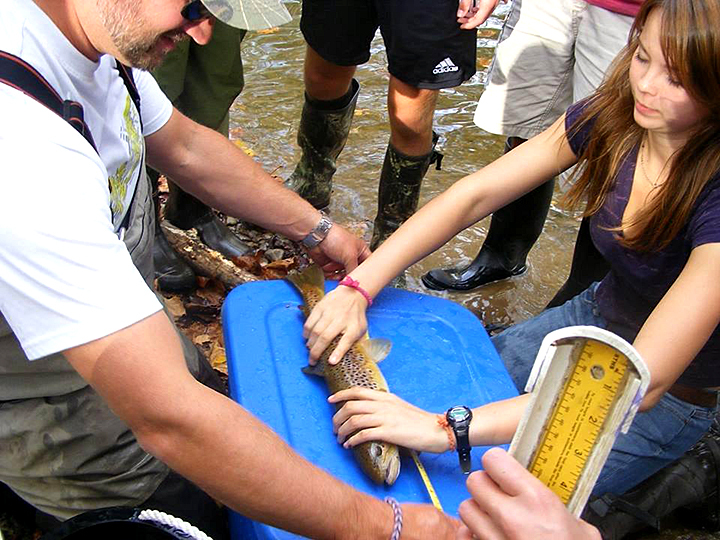 QV Creeker Laura Kou (2013) works with Eric Chapman of Western PA Conservancy to measure Brown Trout caught on Little Sewickley Creek. 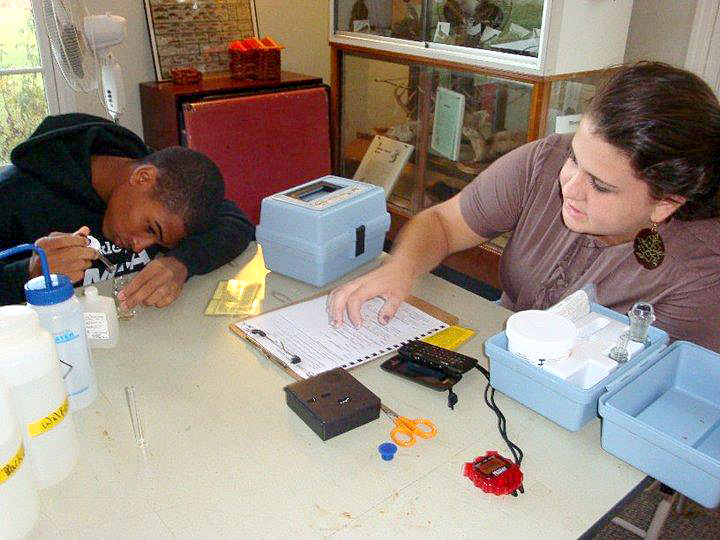 QV Creekers Abbey Depace and Wilson Perez (2010) test the dissolved oxygen level of one of the creek samples. 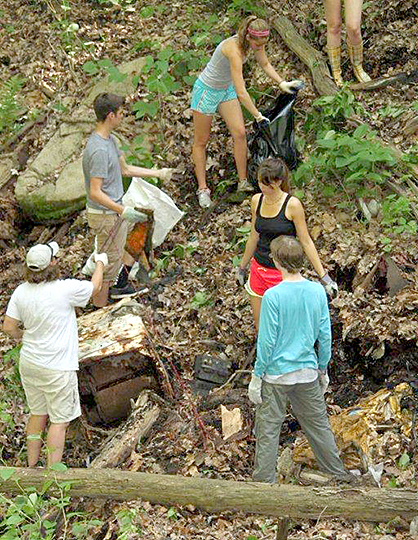 Spring 2012 - QV Creekers working to clean up the Little Sewickley Creek watershed. 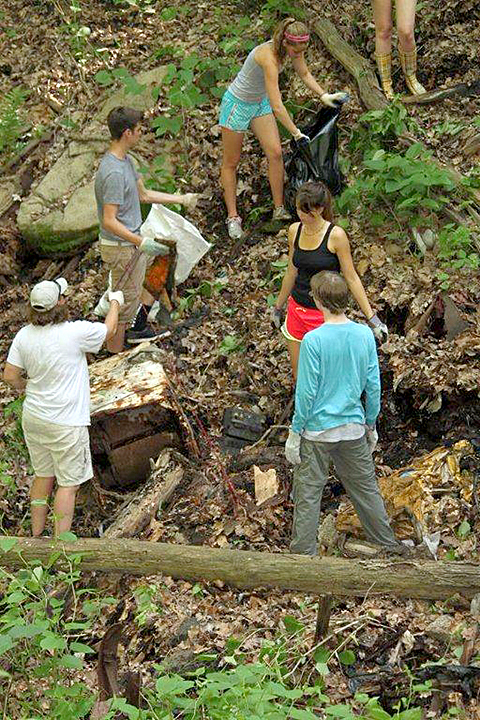 Spring 2013 - QV Creekers remove debris and trash from a secluded and beautiful section of the Little Sewickley Creek watershed. Fall 2013 - QV Creekers check under carefully placed cover boards with program coordinator April Claus as part of an ongoing study of amphibian diversity within the Little Sewickley Creek watershed. Trash is removed from the creek. 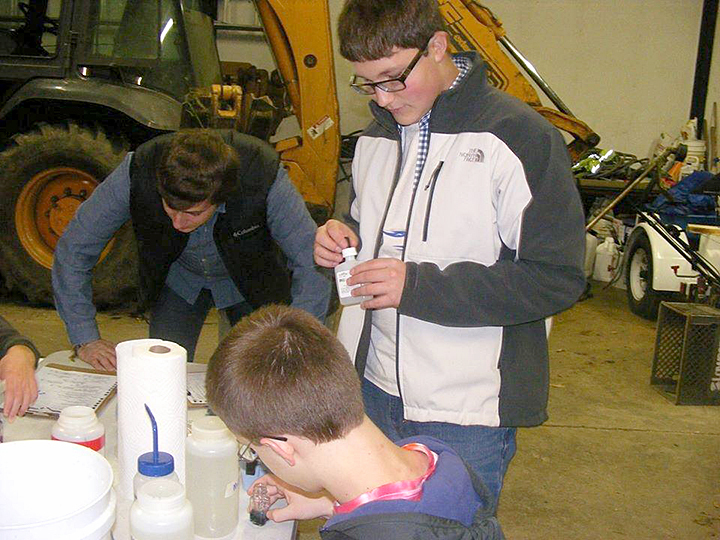 Kurt Branby (Creek Connections – Allegheny College) helps Creekers Christian Tobias and Daniel Frishkorn (2013) to test the alkalinity level in a sample from Little Sewickley Creek. The QV Creekers monitor 5 different sites throughout the watershed. QV Creekers, Hannah Bablak, Mimi Zipparo and Colby Schmitt help Amy Miller (Watershed Specialist with Allegheny County Conservation District) to test the oxygen levels in the salamander ponds in the Fall of 2013. Amy Miller has been instrumental in helping QV Creekers with water quality testing throughout the watershed. 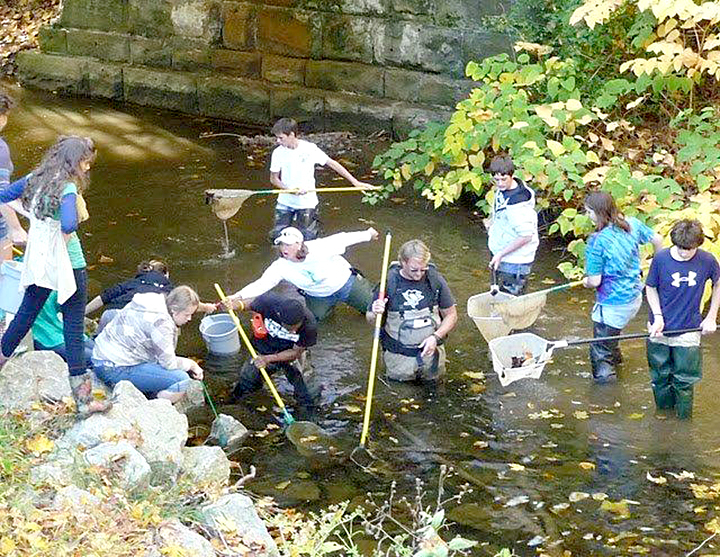 As part of learning to be stewards of the Little Sewickley Creek watershed, the student interns work with other local environmental groups to organize events and projects of benefit to the creek and watershed alike: tree planting, erosion control projects, invasive plant removal, reptile and amphibian surveys, creek clean-ups, fish species population counts, trout stocking among others. 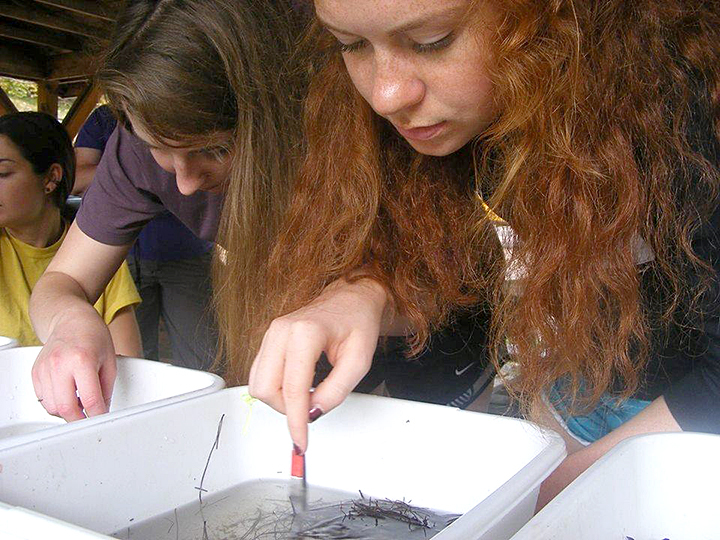 Participants also learn by working with environmental professionals in the fields of biology, botany, geology herpetology (study of amphibians), ichthyology (fish zoology), aquatic ecology, and environmental science. 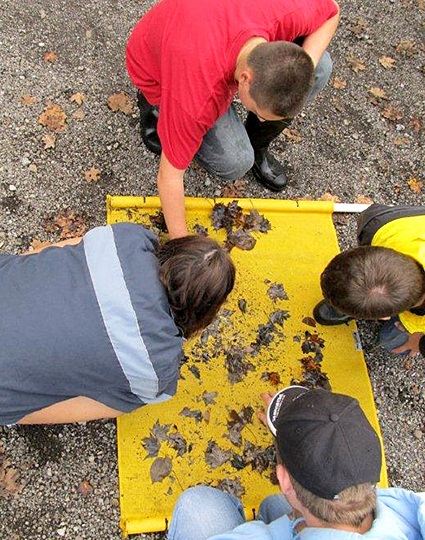 The interns also serve as “watershed educators or mentors” in delivering the creek programs every spring to all 5th grade students in our district. 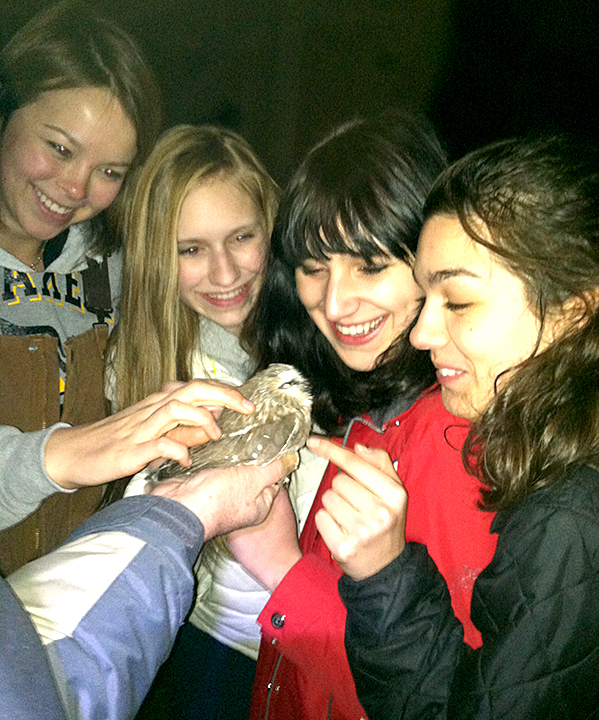 QV Creekers (Laura Kou, Colby Schmitt, Lauren Life and Madeline Hoey) get up close and personal with a Northern Saw Whet owl when helping Bob Mulvihill from the National Aviary with a banding project in Winter 2013. Jovanna Valladares (2009) searches for macro invertebrates clinging to the underside of rocks in a tributary to Little Sewickley Creek near Walker Park. 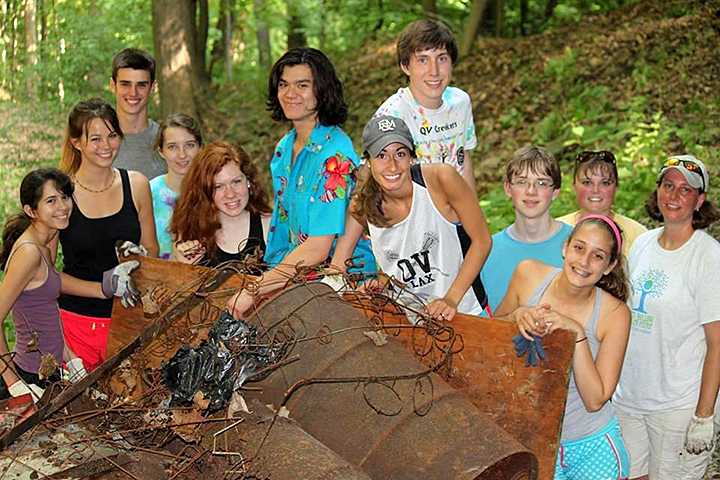 QV Creekers (2013) work cleaning up trash and other debris dumped over a hillside into a local tributary. QV Creekers examine kick net sample during training in September 2011. 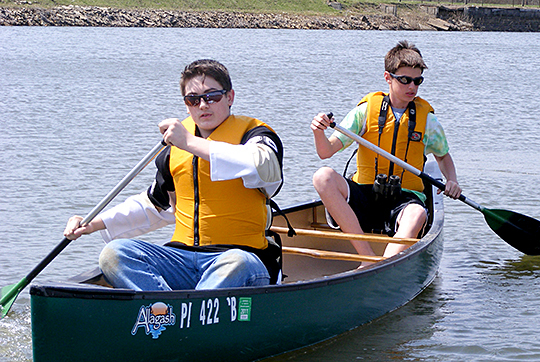 QV Creekers (Derek Hiller and Eric Bergdoll) enjoy fun outdoor activities, such as canoeing, after the Creek Connections symposium in 2011. 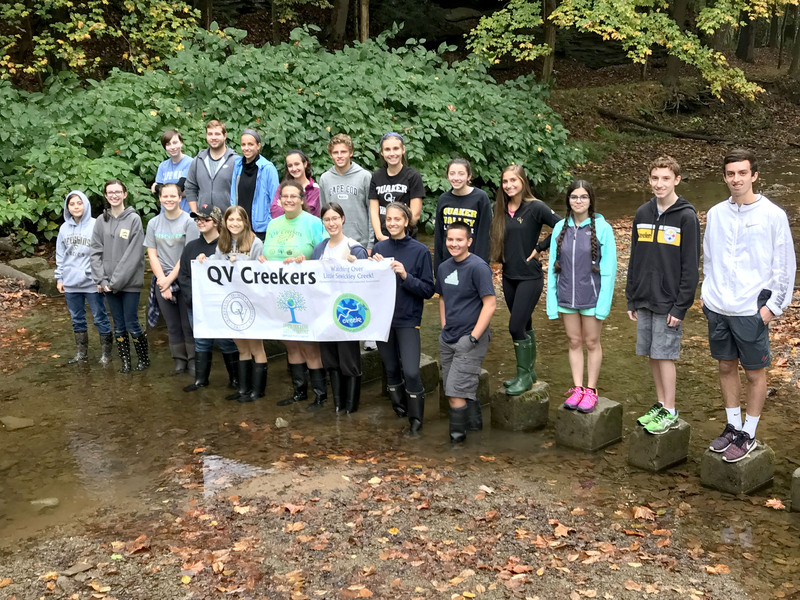 QV Creekers participate in Allegheny College’s Creek Connections symposium every year. They display their group project and interactive with other students participating in the program throughout western, PA.
Each year, the interns develop and design a group research project- to include setting up experiments, collecting and analyzing data for presentation at the annual Creek Connections meeting of Allegheny College. This symposium draws students from all over southwestern Pennsylvania. For additional information about QV Creekers or to speak with April Claus, program manager, send an email to fhncnaturalist@verizon.net.